During your flight you will be handed 2 blank forms. One of them is 1-94 departure record, and the other one is Customs Declaration Form. Remember, they are very easy to fill out, and if you need help or have questions ask flight attendant to give you some assistance. 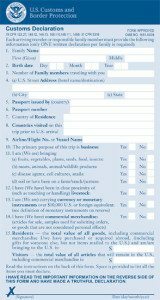 You should fill them out before the arrival, so you do not lose time at the customs. Samples of each form are attached below and you can click to enlarge for better view. We encourage you to print the samples and carry them with you, so they can help with filling the originals. Proceed to the terminal area for arriving passengers. Have the following documents available for presentation: your passport; the sealed envelope that contains your DS-2019; Arrival-Departure Record Form (I-94); and Customs Declaration Form (CF-6059). The Form I-94 should reflect the address where you will reside, not the address of the program. All visitors entering the United States must state their reason for wishing to enter the country. You will also be asked to provide information about your final destination. It is important that you tell the CBP Officer that you will be an exchange visitor. Be prepared to include the name of your employer and address of your final destination. Then you will head to claim your baggage. After you claim you luggage you will be directed to arrivals hall, where our E-Point representative will greet you and give you orientation. In case you have difficulty finding us please dial FREE 1-877-755-2959 from any of the numerous payphones that are in the terminal.